"Mickey Mantle and Ron Lichty's fantastic book can make the people part of your technology operation significantly less hard. Mantle and Lichty understand that it's typically not technology that determines successful projects: it's human beings that make the difference. Instead of focusing on technical solutions, they explore and reveal the human side of technology projects: who your developers are, what makes them tick, what they care about. The book is not just about managing programmers as the title may suggest. It’s about that and much more. It’s about how to establish and maintain an effective and productive programming team in order to deliver quality software on time and on budget. Without hesitation, Mantle and Lichty’s book is absolutely one every tech team manager needs to get their hands on and read cover to cover. Looking for ways to motivate your employees? Consider some tips from a recent book on how to motivate software professionals. 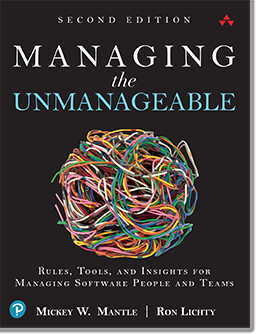 They might not work for everyone, but Mickey W. Mantle and Ron Lichty, authors of Managing the Unmanageable: Rules, Tools, and Insights for Managing Software People and Teams, clearly understand how to manage software professionals. Paul Shread, Time, "Eight Ways to Motivate Employees"
CIO.com interviewed industry professionals to find out how career mapping can add value to your company and keep your employees happy at the same time. 'It's important for tech folks to have a vision of where they are going and what they need to do to get there. That's the essence of career mapping,' says Mickey Mantle, co-author of the new book, Managing the Unmanageable: Rules, Tools, and Insights for Managing Software People and Teams…. 'It takes effort; you've got to have the wherewithal to stand up to the criteria you've set. If someone fulfills it, you are going to promote them and pay them more,' says Mantle. The payoff is a happier, more manageable, easier-to-retain workforce. It provides a win-win scenario for both employers and employees. Rich Hein, CIO.com, "Career Mapping Offers a Clear Path"
...destined to become an extremely valuable resource for those who lead and manage developers. Andy Jordan, ProjectsAtWork, "Managing the Unmanageable"
Are your IT staffers simply going through the motions? Are projects too often going over schedule and over budget? A new book, Managing the Unmanageable: Rules, Tools, and Insights for Managing Software People and Teams, takes a close look at how to get the most out of your employees, especially when they bring a variety of personality types and skill sets to the workplace. For CIOs, this can be a challenge, as your typical software engineer or IT networking professional might be a totally different type of character than someone in accounting. Your tech stars tend to be highly curious and inquisitive, yet easily bored. In the book, authors Mickey W. Mantle and Ron Lichty offer tips for making better connections. Dennis McCafferty, CIO Insight, "Ten Ways to Motivate Your Employees"
The thing I liked most about this book is that it borrowed some of the best processes in the industry, but is absolutely not process centric. Meaning you'll hear some nuggets of Scrum and other processes, but none of them are highlighted in the book. This book is all about understanding the programmer, your environment, and yourself, and how to make the right decisions given your environment. “My belief is that compiled information is knowledge, knowing what to do with the knowledge is wisdom. I see a whole lot of knowledge these days, but very little wisdom. The authors of this book have successfully compiled wisdom. Reading this book will change the way you work with programmers. Every single chapter of this book is a real gem. “One very cool section of the book is the 60 page insert titled Rules of Thumb and Nuggets of Wisdom. It contain short blurbs and quotes from some of the leaders of the programming industry. Cracking open this section you can lose track of time going through them and thinking about them. “This book will become a classic to turn to over time. Every manager interacting with programmers should read this book. That includes CIOs, Software Architects, Enterprise Architects, and Lead Developers. 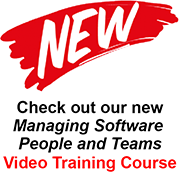 You don't need to have the word manager or director in your title. If in your role you find you are managing a team of developers, you should read this book. Tad Anderson, SOA World, "Managing the Unmanageable"
The book starts with the sociology and psychology of programmers, and why they are fundamentally hard to manage. Rather than caricature, it sorts programmers along many dimensions to uncover team dynamics and motivational principles. "This is a book that every programming manager should have on his shelf. Rich Mironov, Mironov Consulting blog, "Managing the Unmanageable"
Once in a while you run across software leaders who, instead of trying to lay down the law, have pulled together Rules of Thumb and Nuggets of Wisdom that they leverage as guidelines, applying their own insights drawn from decades of experience. Mickey Mantle and Ron Lichty fall into that category. Matthew Heusser, InformIT.com, "Managing the Unmanageable: An Interview with Mickey Mantle and Ron Lichty on Managing Programmers"